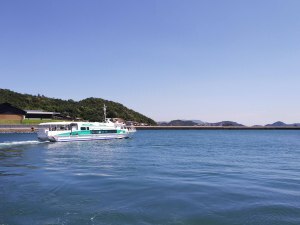 A regular line between three islands, which connects Miyanoura Port of Naoshima (Kagawa-gun, Kagawa prefecture), Ieura Port of Teshima (Shozu-gun, Kagawa prefecture) and Inujima Port of Inujima (Okayama City, Okayama prefecture) in about an hour by high-speed passenger ship. A regular line between Uno Port (Tamano City, Okayama prefecture) and Honmura Port of Naoshima Island (Kagawa-gun, Kagawa prefecture) in about 20 minutes by passenger ship. 3 passenger ships are in operation, which carry up to 65 or 80 passengers. 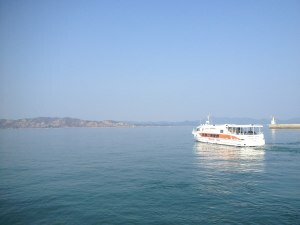 A regular line between Uno Port (Tamano City, Okayama prefecture) and Miyanoura Port of Naoshima Island (Kagawa-gun, Kagawa prefecture) in about 20 minutes by car ferry and 15 minutes by passenger ship. A regular line between Takamatsu Port (Takamatsu City, Kagawa prefecture) and Miyanoura Port in Naoshima Island (Kagawa-gun, Kagawa prefecture) in about an hour by car ferry and about 30 minutes by high-speed passenger ship. A regular line to the isolated islands which connects Haboro Port (Haboro-cho, Tomamae-gun, Hokkaido Prefecture) and Teuri Island (Haboro-cho, Tomamae-gun, Hokkaido Prefecture) via Yagishiri Island (Haboro-cho, Tomamae-gun, Hokkaido Prefecture) in 1 hour and 35 minutes by car ferry, and in 60 minutes by high-speed passenger ship. A regularly operated car ferry connecting Esashi Port (Esashi Town, Hiyama Subprefecture, Hokkaido) to Okushiri Port of Okushiri Island (Okushiri, Okushiri District, Hokkaido) in 2 hours and 20 minutes, and Setana Port (Setana Town, Kudo District, Hokkaido) and Okushiri Port of Okushiri Town (Okushiri Town, Okushiri District, Hokkaido) in 1 hour and 35 minutes. 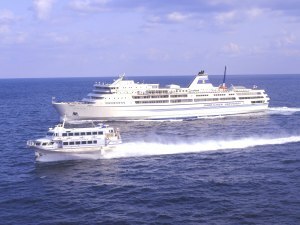 A regular cruise route of a large passenger ship that connects Takeshiba Passenger Ship Terminal of Tokyo Port with Chichijima of the Ogasawara Islands in a 24 hour long ride. A regular large passenger cruise ship that departs from the Takeshiba Passenger Ship Terminal of Tokyo Port and goes to Hachijo-jima while stopping by Miyake-jima and Mikura-jima of the Izu Islands in 10 hours and 20 minutes. 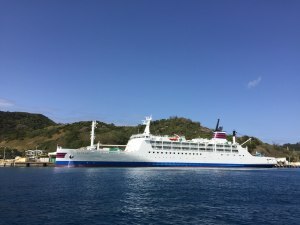 The large passenger ship in operation is Tachibana-maru, which can carry 1,000 passengers. A regular large passenger cruise ship that departs from the Takeshiba Passenger Ship Terminal of Tokyo Port and stops by Izu Oshima, To-shima, Niijima, Shikinejima before arriving at Kozushima in 9 hours and 55 minutes. The Jetfoil ship takes 3 hours and 5 minutes. A regular car ferry with two ships and two routes that connects Takahama Port and Gogo Island. One route connects Takahama Port (Ehime Prefecture, Matsuyama City) and Yura Port of Gogo Island (Ehime Prefecture, Takahama City) in about 15 minutes. The other route connects Takahama Port with Tomari Port of Gogo Island (Ehime Prefecture Matsuyama City) in about 10 minutes. 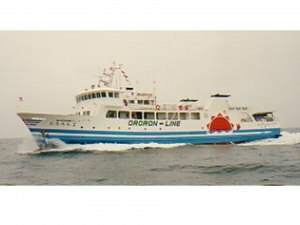 A regular ferry service that connects Wakkanai Port (Hokkaido Wakkanai City) and the Oshidomari Port of Rishiri Island (Hokkaido Rishiri District) and the Kafuka Port of Rebun Island (Hokkaido Rebun District) by car ferry. A 1 hour and 40~55 minute ferry ride. 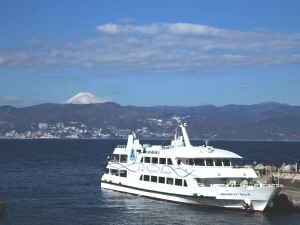 A regular passenger ship line service that connects Atami Port (Shizuoka Prefecture, Atami City) and Hatsushima island Port (Shizuoka Prefecture, Atami City) with a 30 minute cruise. Services by 2 ships are available: Ile de Vacances Premia with 605 seat capacity, a highly stable cruise and barrier free designs; Ile de Vacances III with 870 seat capacity and a swift cruise. A regular line from a remote island which connects Ogi Port of Sado Island (Sado-shi, Niigata-ken) and Naoetsu Port (Joetsu-shi, Niigata-ken) by a high-speed car ferry in one hour and forty minutes. 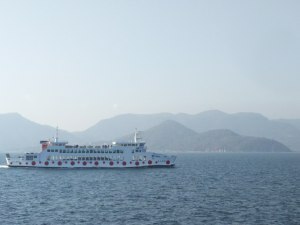 A regular line to a remote island connecting Niigata Port (Niigata-shi, Niigata-ken) and Ryotsu Port on Sado Island (Sado-shi, Niigata-ken) by car ferry in 2 hours and 30 minutes, and by jetfoil in 65 minutes. Two large car ferries are in operation and accommodate 1,500-1,705 passengers, and 168-290 passenger vehicles. Also a jetfoil accommodates 250 passengers.